Our Jamboree is a lot of things, but most of all it’s an opportunity to meet up with other ShopBotters, to learn about how ShopBotters are adjusting to changing economic realities, and especially, how they are using their Bots. We at ShopBot attempt to make the event as useful as possible with presentations that we hope will be informative and interesting, tales of new happenings at ShopBot (and a Saturday shop tour and CNC demo), featured vendors who have been supportive of ShopBotters, and all the while we try to carve out as much time as possible for talk and interaction between ShopBotters. If you are coming, don’t forget to bring something to “show and tell” — everyone likes to hear from everyone and see the kinds of things they do. Don’t be intimidated about what CNC level you are at or your presentation skills — everyone will enjoy hearing about your projects. 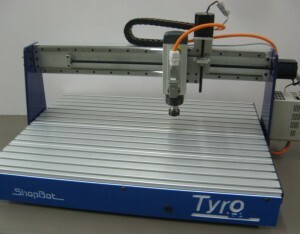 We will be showing off the final prototypes of our new, desktop, Tyro CNC’s. Here’s a glimpse for those who cannot make it to the Jamboree. We’ll be posting more info in the coming weeks on the website Tyro page. We will also show our new beam extrusion which is the product of a collaboration with Bishop-Wisecarver. The beam is functionally equivalent to our current extrusion and has a similar shape, but it has been designed to accommodate hardened BWC rails press-fitted into the extrusion. This new system provides a simple, robust, high-tolerance, and very smooth rail system for our gantry axes. The new beam will be displayed on a Buddy at the Jamboree site and on a new format ShopBot, an 8′ (Y-axis) by 5′ (X-axis) ATC tool, that we will be using for demos at ShopBot on Saturday. As always, at the Jamboree there will be talks on a number of issues ShopBotters are interested in, from signmaking and cabinets, to design software and digital construction of buildings. – Jillian Northrop and Jeffrey McGrew of Because We Can will be talking about their uniquely creative digital fabrication business. – A Durham entrepreneurial leader, Christopher Gergen, will speak about innovations in entrepreneurship (and his book, Life Entrepreneurs). – We have David ten Have here from New Zealand — Ponoko’s founder and lead developer and a participant in the 100kGarage.com project (see INC Magazine article on David). – Robert Bridges will describe his Shelter 2.0 project intended to offer quick, affordable, digitally-fabricated housing in disaster areas. All-in-all it should be a pretty exciting two days. There’s also ShopBot training on Thursday and the North Carolina Maker Faire following on Sunday.